Some of our past puppies, chocolate and cream dapple, Isabella and cream, and chocolate and cream... all longhairs. Now living in Napa, CA. Tehachapi, CA. 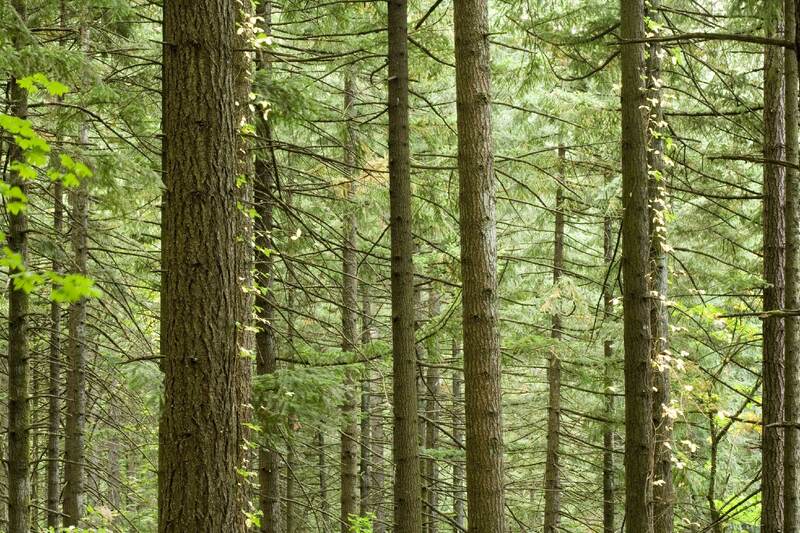 and Northern California. We will have puppies in all these colors coming end of 2017 and early 2018.
chocolate and tan dapple doxie​ Girl now lives in San Diego, CA. black and cream dapple longhair boy, now lives in San Francisco, CA. 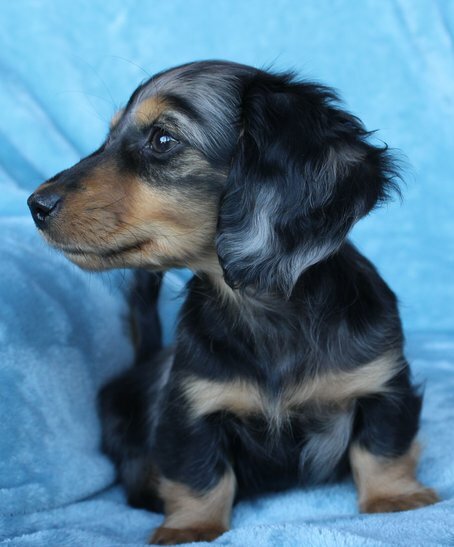 Black and tan dapple longhair boy, he now lives in Paso Robles, CA. An amazing chocolate and tan longhair girl, she will live in Riverside, CA. 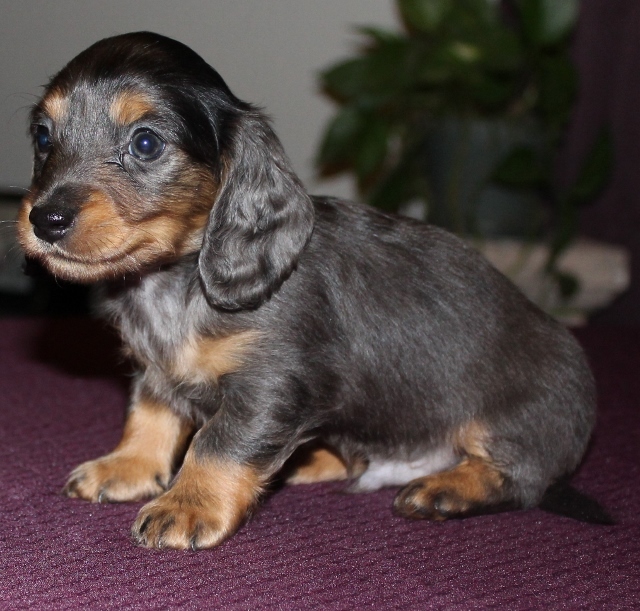 This very pretty black and tan dapple boy, will be living in Bakersfield. CA. 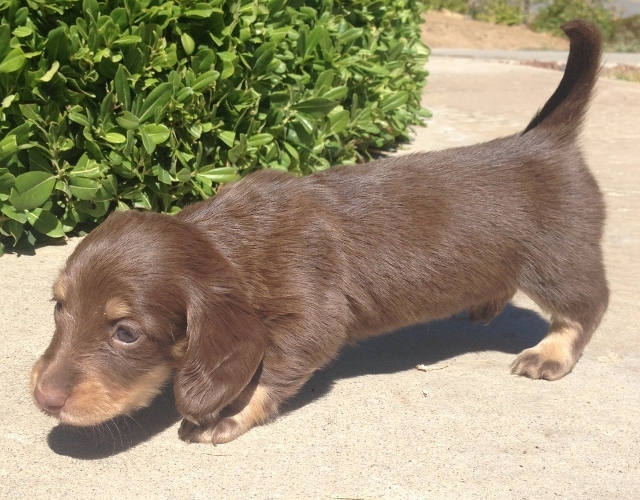 chocolate and tan dapple doxie boy. Black and tan longhair doxie boys! This great red dapple longhair boy now lives in Nevada. 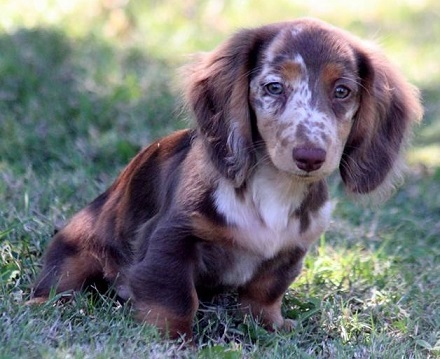 This is a chocolate and tan piebald boy . We breed dachshunds in sunny California! 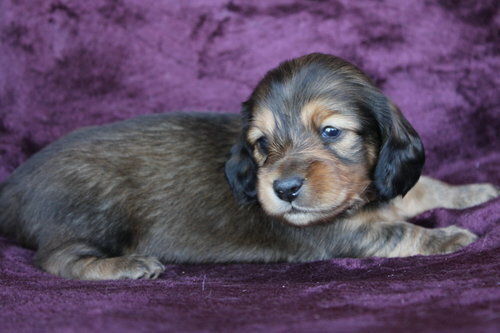 This is a cute little chocolate and tan piebald girl with lots of ticking, mini dachshund. She will be living in Southern California and will be greatly loved! 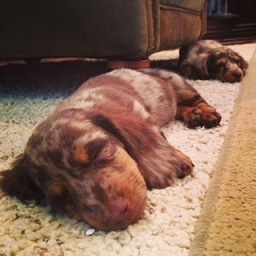 These two chocolate and tan doxie girls will be living together in Clovis California and will be loved dearly! 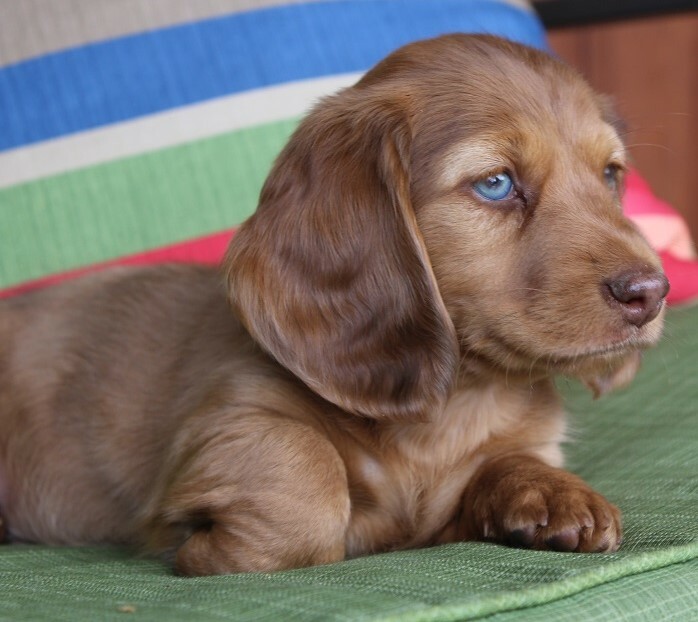 This adorable red longhair doxie boy is the perfect represenative for the dachshund breed. 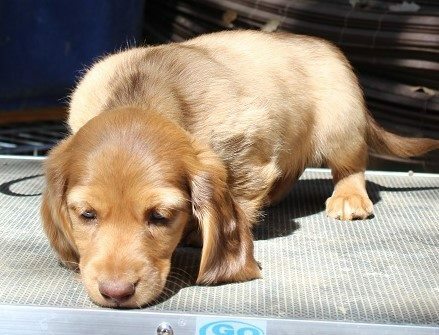 What a gorgeous longhair reverse red brindle dachshund male pup. 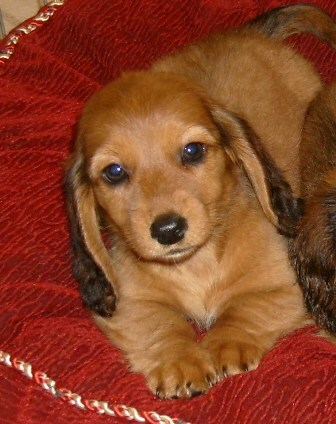 This guy is a red brindle longhair doxie male puppy with awesome conformation and personality. 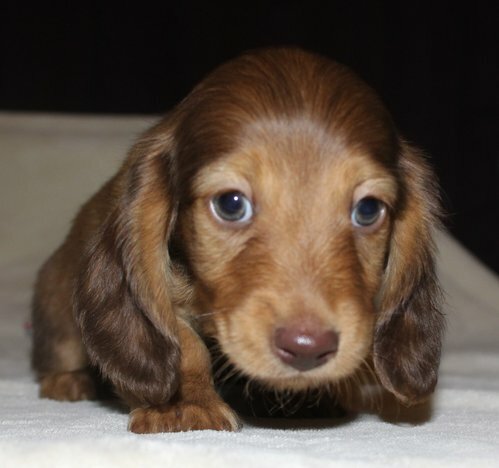 What an adorable little female...longhair shaded red doxie puppy. 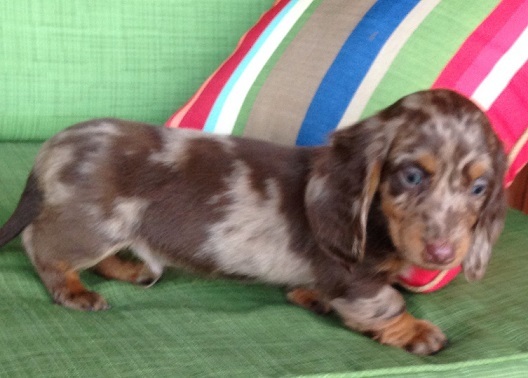 Black and tan piebald dachshund puppy with lots of ticking. carries for chocolate and tan. blue and tan, isabella and tan and piebald. 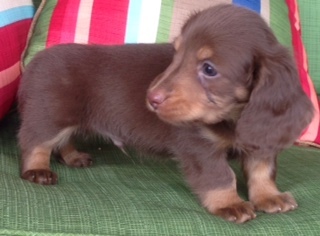 Black and tan piebald doxie puppies carries for chocolate and tan, isabella and tan, blue and tan, and piebald. Thant's a dog pile! 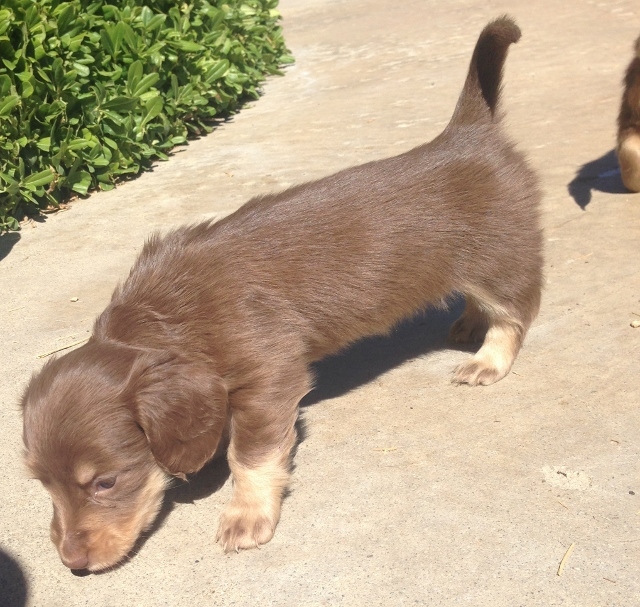 Black and tan piebald dachshund puppy carries for chocolate and tan, blue and tan, isabella and tan , red and piebald. Casper is a red piebald with lot off ticking. He has found his forever home. He will be living in Pierre, South Dakota, with his new mom Lieghann. Thank you. 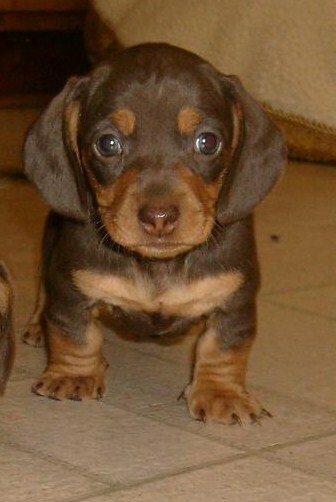 Black and tan piebald dachshund puppy. 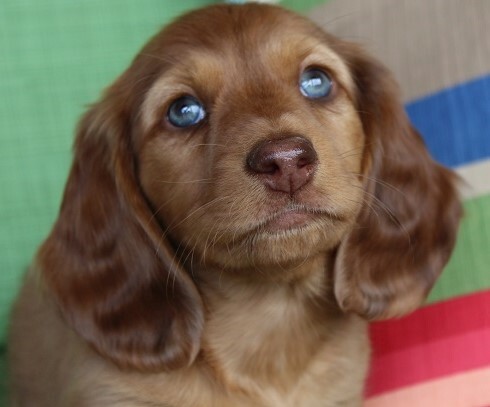 This is an adorable red piebald doxie pup, his mom is also a red piebald and his dad is an isabella and tan piebald dachshund. 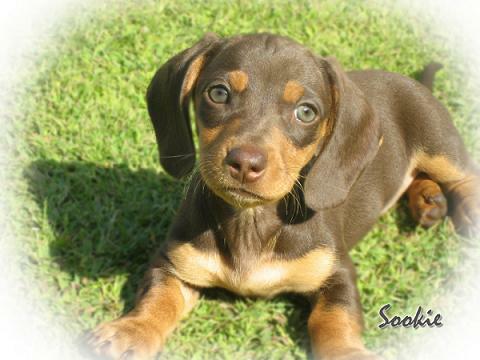 Now lives in southen California.Dachshund breeder. 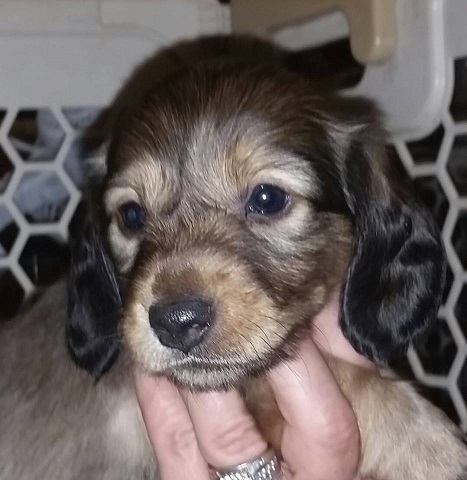 This cute and playful pup is a black and tan piebald doxie, his mom is a red piebald dachsie and his dad is an isabella and tan piebald doxie. he carries for chocolate and tan, blue and tan, red, black and tan and isabella. 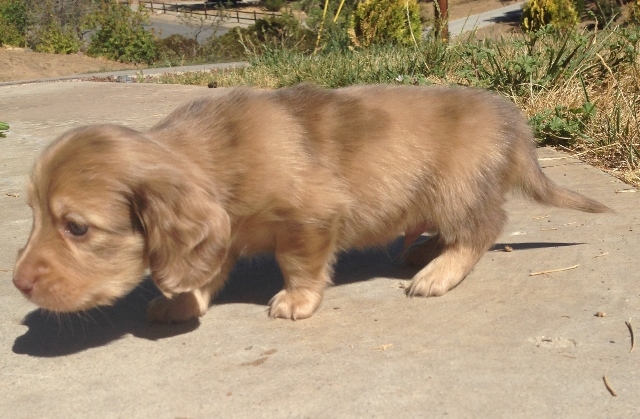 Now lives in southern California.Dachshund Breeder. This Bella and she is a red piebald dachshund, her mom is also a red piebald dachshund and her dad is an isabella and tan piebald dachsie. 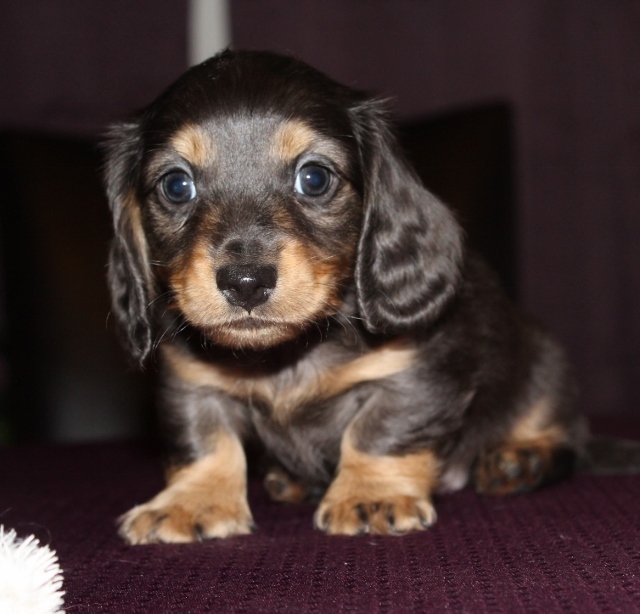 A very cute and fun loving black and tan piebald dachshund puppy. Cathy and Sandy , two black and tan doxie girls. 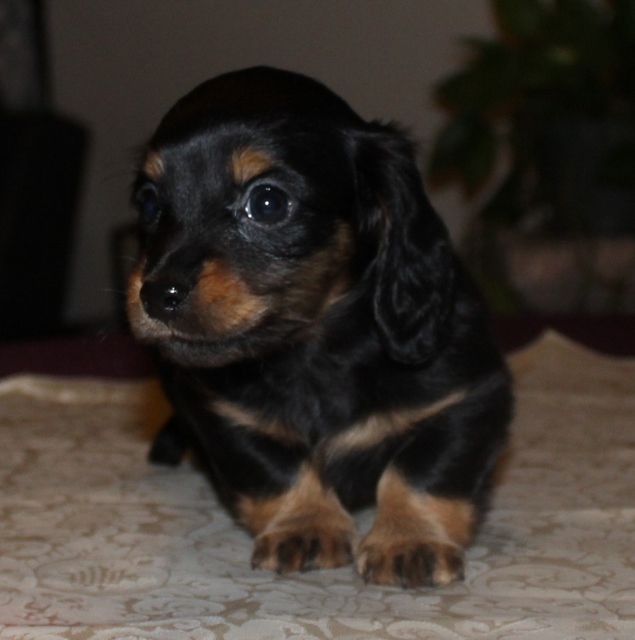 This is an adorable black and tan mini doxie, bred in California, her mother is a black and tan dapple mini dachshund. 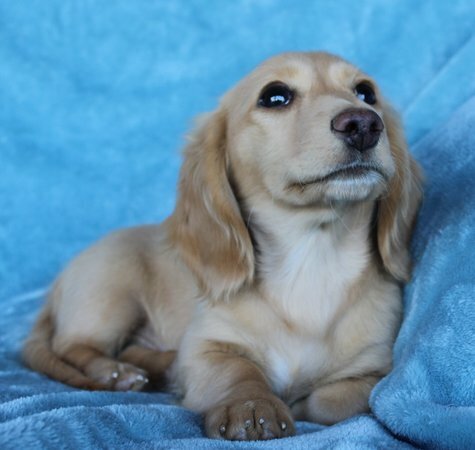 Her sire is an isabella and tan dachsie from carrpuppies . Lives in Bakersfield CA. Doxie breeder. 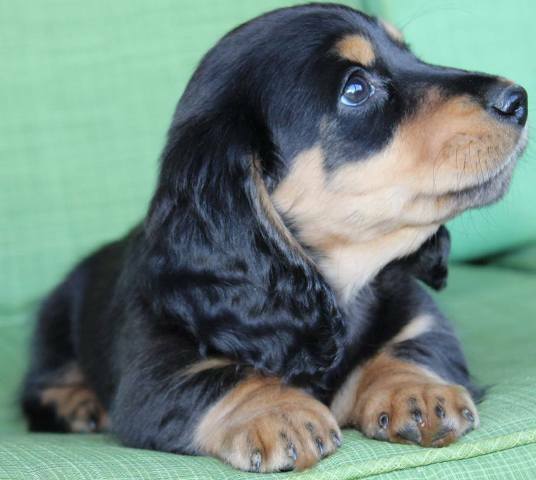 This pretty girl is also a black and tan dachshund, whose mom is black and tan dapple and dad is isabella and tan doxie. 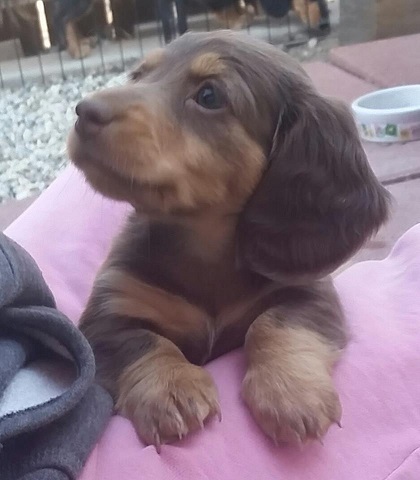 This is an awesome chocolate and tan dapple dachshund puppy, long coat out of a black & tan dapple dachsie mom and an isabella and tan dad. 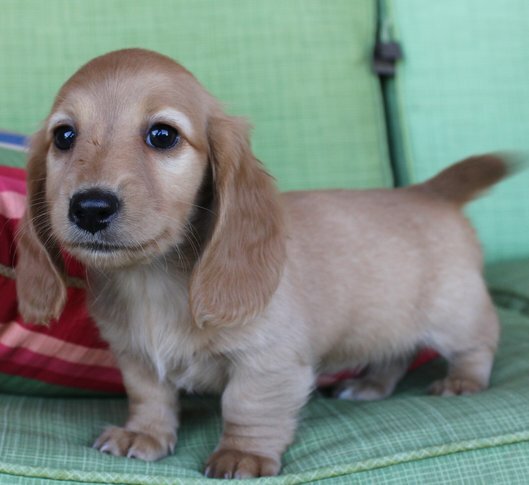 Dachshund breeder. This is our little Rambo, he is a shaded red doxie puppy long coat and his mon is also black & tan dapple and dad is an isabella and tan dachshund Now lives in Hollywood California. This is Casey and Logan's litter, they were born 12/30/08.These handsome pups are all in their new homes now. Casey is a black & tan piebald doxie. 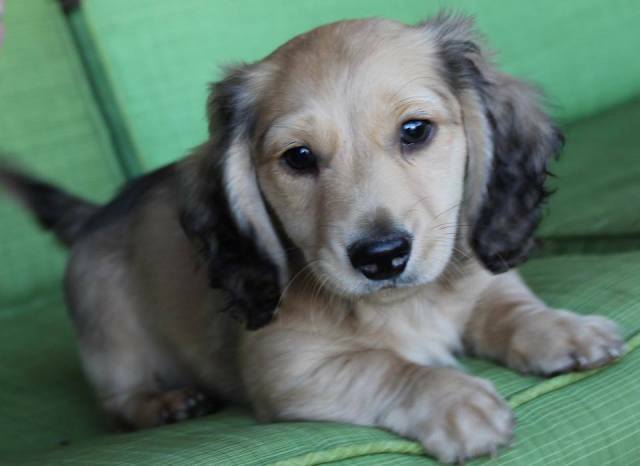 Logan is a blue and tan dachshund from dachshundpuppieslnrs. From left to right: Hauns, Louie, Rex, Ollie, & Marilyn. We had four black and tans and one black and tan piebald. Hauns is a black and tan doxie with hidden tan points, his mom is a black and tan piebald dachshund and his dad is a blue and tan doxie. Now lives in southern California. MARILYN is a black and tan dachshund and her mom is a black and tan piebald doxie and her dad is a blue and tan dachsie. 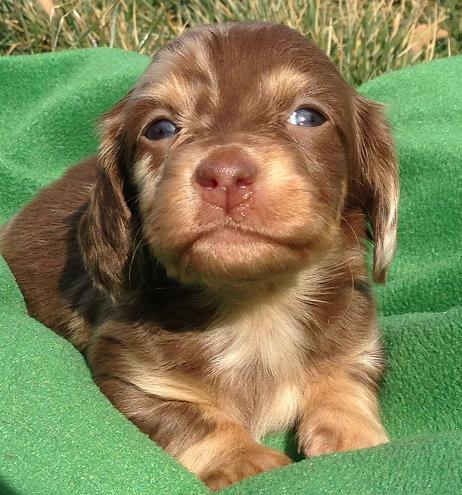 REX is a black and tan piebald doxie like his mom and his dad is a blue and tan dachshund. Now lives in Southern California. LOUIE is a black and tan dachsund his mom is a black and tan piebald dachsie and his dad is a blue and tan dachshund. 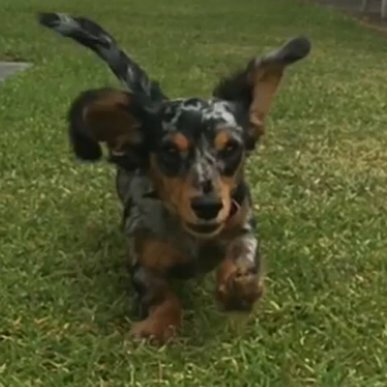 OLLIE is a very plyful and fun dachsie, he is a black and tan dachshund and is mom is a black and tan piebald dachshund, his dad is a blue and tan doxie. Now lives in Southern California.